- FEATURES: DUAL Channel, which means you can use with 2 Pads for Smaller Body Parts or 4 For Large Body Parts or Multiple Body Parts. You can even Purchase a Back Wrap Accessory (sold separately) at a Later Time is you wish making iReliev one of the most flexible systems out there. The Clear LCD Shows Program Mode P1-P8, Power Level, Battery Life, 5-60 Adjustable Timer, Intensity Output By Channel and Auto-Lock Out Feature While On Go! 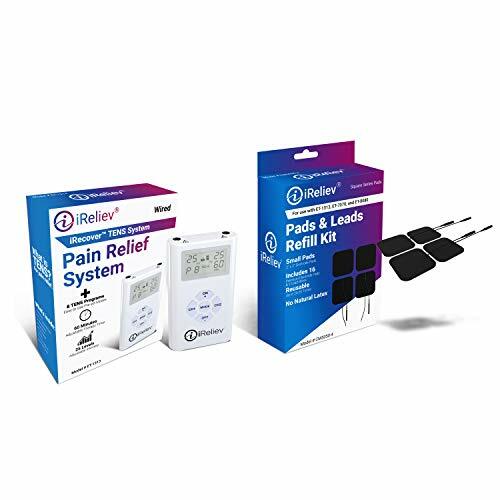 - FEATURES:The iReliev Pain Relief System Features 8 Pre-Programmed Therapy Modes. Customize Your Therapy Based on Acute or Chronic Pain. Use P8 for Arthritis. RX Equivalent Output Intensity Offer 25 Levels--or 80 mA, Unmatched for a Device the Footprint of a Credit Card. You can wear on your Body Un-noticed, while You're at Work, On the Go or Relaxing at Home. - WHAT IS TENS? : Stands for "Transcutaneous Electrical Nerve Stimulation"- a safe, non-invasive, drug free method of pain relief used by Physical Therapists and prescribed Doctors for over 30 years. The iReliev Bundle delivers low-voltage pulses to the skin to stimulate nerve fibers effectively blocking the pain signal to your brain. Also increases natural endorphins--a natural pain reliever. You can say GOODBYE to those pain pills that have been dulling your life! - SAFE & EFFECTIVE: FDA Cleared for Natural Pain Relief! The iReliev System is safe and requires no prescription. Over the Counter Pain Relief Without Harmful Drugs or Invasive Devices. - WHY ITS BETTER: iReliev Technology is easier to use, More Effective, Compact & Portable. SAY NO..TO TV REMOTE CONTROL SIZE DEVICES THAT MAKE PORTABLE THERAPY IMPOSSIBLE. The iReliev System is perfect for therapy on the go. INCLUDED is iReliev's...EZ CARRY CLIP & HOLSTER. WEAR CONCEALED AND UNDER YOUR SHIRT. Wearing your TENS around your neck with some silly lanyard is a thing of the past with iReliev.